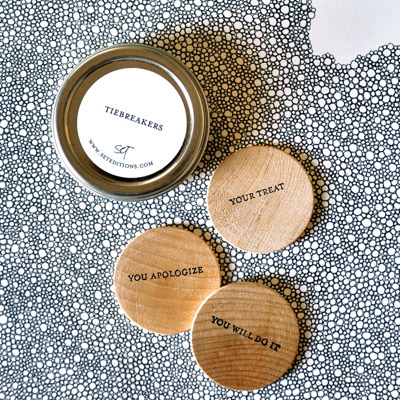 Three double-sided wooden coins to be tossed when two sweethearts just can't agree. I SMELL A SHOWER GIFT. Can I register for these, must have wedding gift. "my treat"? who are these people? Nikki, thank you for the additional customer benefit. 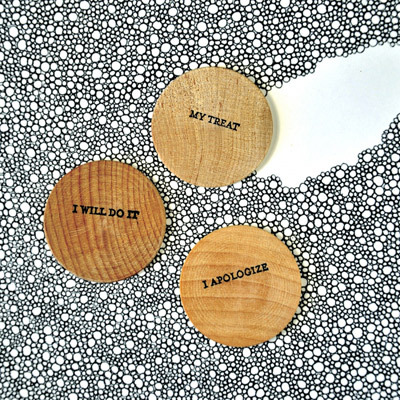 I also need one of these sets for dinner options and then I think most of our annoyances would be ended. wait, no. that would be a three-sided coin, wouldn't it? I think we need several coins + customized ones with our personal restaurant defaults (or at least classes of food?). OMG I am buying these for my mother seriously this minute. Am visiting her as we speak and I'm about to commit either suicide or hara-kiri if she and her bf don't stop bickering. Yet another reason that eastsidebride is the only wedding blog that's REALLY worth reading. Especially when the wedding is getting closer and closer!